Back in December, I did a 12 days of Christmas baking. My friend Brian posted a truffle recipe, he also shot me some variations. I used one of these variations yesterday for our Foster party tonight. Yum! Cover two cookie sheets with wax paper and set aside. Cream sugar and peanut butter together (will develop a sandy texture). Blend in three egg whites, one at a time, making sure each is fully combined before adding the next. The mixture will resemble cake frosting at this stage. Melt the White Chocolate in a microwave (60 to 90 seconds, be sure to mix well after the first minute). Allow chocolate to cool slightly and then add to mixture. Combine thoroughly and quickly (chocolate will start to set) and spoon onto wax paper (like making small drop cookies). Place in freezer for ten to fifteen minutes to set firmly. Melt Semi-sweet chocolate in a double boiler. 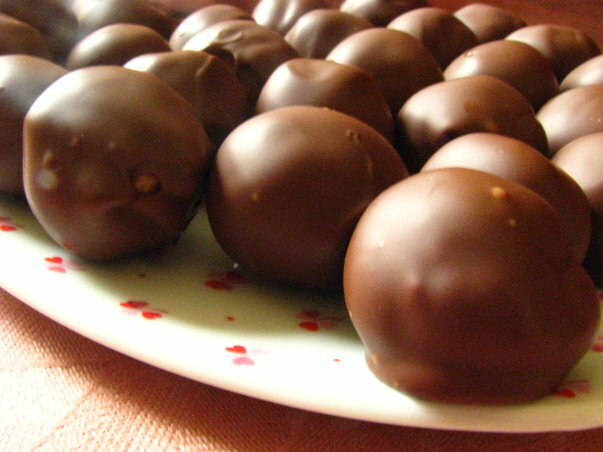 Remove fillings from freezer, dip in melted chocolate and return to wax paper. When all the chocolates are dipped, return them to the freezer for another ten to fifteen minutes to allow the chocolate to set. They may then be moved to air-tight containers for storage or served. Allow them to warm to room temperature before serving. oh my word LOVE this recipe. Yum!